"Choctaw Nation" redirects here. For other uses, see Choctaw Nation (disambiguation). The Choctaw Nation (Choctaw: Chahta Yakni) (officially referred to as the Choctaw Nation of Oklahoma) is a Native American territory and federally recognized Indian Tribe with a tribal jurisdictional area and reservation comprising 10.5 counties in Southeastern Oklahoma. The Choctaw Nation maintains a special relationship with both the United States and Oklahoma governments. As of 2011, the tribe has 223,279 enrolled members, of which 84,670 live within the state of Oklahoma and 41,616 live within the Choctaw Nation's jurisdiction. A total of 233,126 people live within these boundaries. The tribal jurisdictional area is 10,864 square miles (28,140 km2). The tribe has jurisdiction over its own members. The chief of the Choctaw Nation is Gary Batton, who took office on April 29, 2014, after the resignation of Gregory E. Pyle. The Choctaw Nation Headquarters, which houses the office of the Chief, is located in Durant. The tribal legislature meets at the Council House, across the street from the historic Choctaw Capitol Building, in Tuskahoma. The Capitol Building is now the Choctaw Nation Museum.. The Choctaw Nation is one of three federally recognized Choctaw tribes; the others are the Jena Band of Choctaw Indians and Mississippi Band of Choctaw Indians. The latter two bands are descendants of Choctaw who resisted the forced relocation to Indian Territory. The Mississippi Choctaw preserved much of their culture in small communities and reorganized as a tribal government under new laws after the Indian Reorganization Act of 1934. Those Choctaw who removed to the Indian Territory, a process that went on into the early 20th century, are federally recognized as the Choctaw Nation of Oklahoma. The removals became known as the "Trail of Tears." The Tribal Headquarters are located in Durant. Opened in June 2018, the new headquarters is a 5-story, 500,000 square foot building located on an 80-acre campus in south Durant joining other tribal buildings such as the Regional Health Clinic, Wellness Center, Community Center, Child Development Center, and Food Distribution. Previously, headquarters was located in the former Oklahoma Presbyterian College, with more offices scattered around Durant. The current chief is Gary Batton and the assistant chief is Jack Austin, Jr. The Tribal Council meet monthly at Tvshka Homma. The tribe is governed by the Choctaw Nation Constitution, which was ratified by the people on June 9, 1984. The constitution provides for an executive, a legislative and a judicial branch of government. The chief of the Choctaw Tribe, elected every four years, is not a voting member of the Tribal Council. They are also elected for four-year terms. The legislative authority of the tribe is vested in the Tribal Council, which consists of twelve members. The General Fund Operating Budget, the Health Systems Operating Budget, and the Capital Projects Budget for the fiscal year beginning October 1, 2017 and ending September 30, 2018 was $516,318,568. The supreme executive power of the Choctaw Nation is assigned to a chief magistrate, styled as the "Chief of the Choctaw Nation". The Assistant Chief is appointed by the Chief with the advice and consent of the Tribal Council, and can be removed at the discretion of the Chief. The current Chief of the Choctaw Nation is Gary Batton, and the current Assistant Chief is Jack Austin, Jr. The Chief's birthday (December 15) is a tribal holiday. Before Oklahoma was admitted as a state to the union in 1907, the Choctaw Nation was divided into three districts: Apukshunnubbee, Moshulatubbee, and Pushmataha. Each district had its own chief from 1834 to 1857; afterward, the three districts were put under the jurisdiction of one chief. The three districts were re-established in 1860, again each with their own chief, with a fourth chief to be Principal Chief of the tribe. These districts were abolished at the time of statehood, as tribal government was dissolved. The tribe later reorganized to re-establish its government. Former districts and capitals of Choctaw Nation, Indian Territory, that existed from 1834-1857, shown with present-day Oklahoma counties. The legislative authority is vested in the Tribal Council. Members of the Tribal Council are elected by the Choctaw people, one for each of the twelve districts in the Choctaw Nation. Current district map of the Choctaw Nation of Oklahoma. 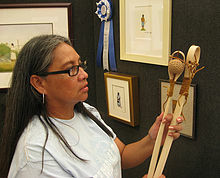 Award-winning painter Norma Howard is enrolled in the Choctaw Nation of Oklahoma. In order to be elected as council members, candidates must have resided in their respective districts for at least one year immediately preceding the election. "Candidates for the Tribal Council must be at least one-fourth (1/4) Choctaw Indian by blood and must be twenty-one (21) years of age or older at the time they file for election." Once elected, a council member must remain a resident of the district from which he or she was elected during the term in office. This policy ensures the involvement and interaction of successful candidates with their constituency. Once in office, the Tribal Council members have regularly scheduled county council meetings. The presence of these tribal leaders in the Indian community creates a sense of understanding of their community and its needs. The Tribal Council is responsible for adopting rules and regulations which govern the Choctaw Nation, for approving all budgets, making decisions concerning the management of tribal property, and all other legislative matters. The Tribal Council Members are the voice and representation of the Choctaw people in the tribal government. The Tribal Councils assist the community to implement an economic development strategy and to plan, organize, and direct Tribal resources to achieve self-sufficiency. The Tribal Council is working to strengthen the Nation's economy, with efforts being focused on the creation of additional job opportunities through promotion and development. By planning and implementing its own programs and building a strong economic base, the Choctaw Nation applies its own fiscal, natural, and human resources to develop self-sufficiency. The judicial authority of the Choctaw Nation is assigned to the Constitutional Court and the Court of General Jurisdiction. The former consists of a three-member court whom are appointed by the Chief. At least one member, the presiding judge (Chief Justice), must be a lawyer licensed to practice before the Supreme Court of Oklahoma. The current[when?] members of the Constitutional Court are Chief Justice David Burrage, Judge Mitch Mullen, and Judge Frederick Bobb. The Choctaw Nation's annual tribal economic impact in 2010 was over $822,280,105. The tribe employs nearly 8,500 people worldwide; 2,000 of those work in Bryan County, Oklahoma. The Choctaw Nation is also the largest single employer in Durant. The nation's payroll is about $260 million per year, with total revenues from tribal businesses and governmental entities topping $1 billion. The nation has contributed to raising Bryan County's per capita income to about $24,000. The Choctaw Nation has helped build water systems and towers, roads and other infrastructure, and has contributed to additional fire stations, EMS units and law enforcement needs that have accompanied economic growth. The Choctaw Nation operates several types of businesses. It has seven casinos, 14 tribal smoke shops, 13 truck stops, and two Chili's franchises in Atoka and Poteau. It also owns a printing operation, a corporate drug testing service, hospice care, a metal fabrication and manufacturing business, a document backup and archiving business, and a management services company that provides staffing at military bases, embassies and other sites, among other enterprises. The Choctaw Nation is the first indigenous tribe in the United States to build its own hospital with its own funding. The Choctaw Nation Health Care Center, located in Talihina, is a 145,000-square-foot (13,500 m2) health facility with 37 hospital beds for inpatient care and 52 exam rooms. The $22 million hospital is complete with $6 million worth of state-of-the-art[clarification needed] equipment and furnishing. It serves 150,000–210,000 outpatient visits annually. The hospital also houses the Choctaw Nation Health Services Authority, the hub of the tribal health care services of Southeastern Oklahoma. The tribe also operates eight Indian clinics, one each in Atoka, Broken Bow, Durant, Hugo, Idabel, McAlester, Poteau, and Stigler. In July 2008, the United States Department of Defense announced the 2008 Secretary of Defense Employer Support Freedom Award recipients. They are awarded the highest recognition given by the U.S. Government to employers for their outstanding support of employees who serve in the National Guard and Reserve. The Choctaw Nation was one of 15 recipients of that year's Freedom Award, selected from 2,199 nominations. Its representatives received the award September 18, 2008 in Washington, D.C. The Choctaw Nation is the first Native American tribe to receive this award. At Andrew Jackson's request, the United States Congress opened a fierce debate on an Indian Removal Bill. In the end, the bill passed, but the vote was very close: The Senate passed the measure, 28 to 19, while in the House it passed, 102 to 97. Jackson signed the legislation into law June 30, 1830, and turned his focus onto the Choctaw in Mississippi Territory. On August 25, 1830, the Choctaws were supposed to meet with Jackson in Franklin, Tennessee, but Greenwood Leflore, a district Choctaw chief, informed Secretary of War John H. Eaton that the warriors were fiercely opposed to attending. Jackson was angered. Journalist Len Green writes "although angered by the Choctaw refusal to meet him in Tennessee, Jackson felt from LeFlore's words that he might have a foot in the door and dispatched Secretary of War Eaton and John Coffee to meet with the Choctaws in their nation." Jackson appointed Eaton and General John Coffee as commissioners to represent him to meet the Choctaws at the Dancing Rabbit Creek near present-day Noxubee County, Mississippi. Say to them as friends and brothers to listen [to] the voice of their father, & friend. Where [they] now are, they and my white children are too near each other to live in harmony & peace.... It is their white brothers and my wishes for them to remove beyond the Mississippi, it [contains] the [best] advice to both the Choctaws and Chickasaws, whose happiness... will certainly be promoted by removing.... There... their children can live upon [it as] long as grass grows or water runs.... It shall be theirs forever... and all who wish to remain as citizens [shall have] reservations laid out to cover [their improv]ements; and the justice due [from a] father to his red children will [be awarded to] them. [Again I] beg you, tell them to listen. [The plan proposed] is the only one by which [they can be] perpetuated as a nation.... I am very respectfully your friend, & the friend of my Choctaw and Chickasaw brethren. Andrew Jackson. -Andrew Jackson to the Choctaw & Chickasaw Nations, 1829. To the voters of Mississippi. Fellow Citizens:-I have fought for you, I have been by your own act, made a citizen of your state; ... According to your laws I am an American citizen, ... I have always battled on the side of this republic ... I have been told by my white brethren, that the pen of history is impartial, and that in after years, our forlorn kindred will have justice and "mercy too" ... I wish you would elect me a member to the next Congress of the [United] States.-Mushulatubba, Christian Mirror and N.H. Observer, July 1830. Midway through the Great Irish Famine (1845–1849), a group of Choctaws collected $710 ($19,000 in current dollar terms) (although many articles say the original amount was $170 ($5,000 after a misprint in Angie Debo's The Rise and Fall of the Choctaw Republic) and sent it to help starving Irish men, women and children. "It had been just 16 years since the Choctaw people had experienced the Trail of Tears, and they had faced starvation… It was an amazing gesture. By today's standards, it might be a million dollars," according to Judy Allen, editor of the Choctaw Nation of Oklahoma's newspaper, Bishinik. The paper is based at the Oklahoma Choctaw tribal headquarters in Durant, Okla. To mark the 150th anniversary, eight Irish people retraced the Trail of Tears. Ferguson states, "1903 MISS: Three-hundred Mississippi Choctaws were persuaded to remove to the Nation in Oklahoma." In 2015 a sculpture known as 'Kindred Spirits ' was erected in the town of Midleton, County Cork, Ireland to commemorate the Choctaw Nation's donation. A delegation of 20 members of the Choctaw Nation attended the opening ceremony along with the County Mayor of Cork. By the early twentieth century, the United States government had passed laws which depleted much of the Choctaw's sovereignty and tribal rights in preparation for the Indian Territory becoming the State of Oklahoma. In violation of earlier treaties, the Dawes Commission registered tribal members in official rolls, and forced individual land allotments upon the Tribe's members allowing the "surplus" land to be ceded for white settlement. Many of the allotments were given "guardianship" to third parties while the owners were underage. During the oil boom of the early 20th century, the guardianships became very lucrative; there was widespread abuse and financial exploitation of Choctaw individuals. Charles Haskell, the future governor of Oklahoma, among other elites, took advantage of the situation. An Act of 1906 spelled out the final tribal dissolution agreements for all of the five civilized tribes and dissolved the Choctaw government. The Act also set aside a timber reserve, which might be sold at a later time and specifically excluded from allotment coal and asphalt lands. After the 1907 statehood of Oklahoma, tribal chiefs were appointed by the Secretary of the Interior. During World War I the American army fighting in France became stymied by the Germans' ability to intercept its communications. Even worse, after intercepting them the Germans were also able to decrypt the codes, reading the Americans' secrets and knowing in advance their every move. Several Choctaw Indians serving in the 142nd Infantry suggested using their native tongue, the Choctaw language, to transmit army secrets. Their gambit proved very successful, and almost immediately contributed to a turn-around on the Meuse-Argonne front. Captured German officers said they were baffled by the Choctaw words, which they were completely unable to translate. According to historian Joseph Greenspan, the Choctaw language did not have words for many military ideas, so the code-talkers had to invent other terms from their language. Examples are "'big gun' for artillery, 'little gun shoot fast' for machine gun, 'stone' for grenade and 'scalps' for casualties." Historians credit these soldiers with helping bring World War I to a faster conclusion. There were fourteen Choctaw Code Talkers. The Army repeated the use of Native Americans as code talkers during World War II, working with soldiers from a variety of American Indian tribes. Collectively these Indians are known as code talkers. Because the terms of the Burke Act of 1906, imposed full citizenship on the tribe 25 years after the law was passed, tribal leaders organized in 1928 by calling a convention of Choctaw and Chickasaw tribe members from throughout Oklahoma. The meeting was held in Ardmore with the purpose of discussing the burdens being placed upon the tribes due to passage and implementation of the Indian Citizenship Act and the Burke Act. Since their tribal governments had been abolished, the tribes were concerned about the inability to secure funds that were due them for their coal and asphalt lands to provide for their tribe members. Czarina Conlan was selected as chair of the convention. They appointed a committee composed of Henry J. Bond, Conlan, Peter J. Hudson, T.W. Hunter and Dr. E. N Wright, for the Choctaw and Ruford Bond, Franklin Bourland, George W. Burris, Walter Colbert and Estelle Ward, for the Chickasaw to determine how to address their concerns. The committee met to prepare the recommendations and broke with precedent, sending Conlan and Estelle Chisholm Ward to Washington, D.C. to argue in favor of passage of a bill proposed by U.S. House Representative Wilburn Cartwright for sale of the coal and asphalt holdings, as well as continuing the restrictions of selling Indian lands. It was the first time that women had been sent to Washington as representatives of their tribes. As part of the Indian termination policy pursued by the US government from the 1940s through the 1960s, a series of laws was passed to enable the government to end its trust relationships with native tribes. One of the first of these laws passed on 13 August 1946—the Indian Claims Commission Act of 1946, Pub. L. No. 79-726, ch. 959. Its purpose was to settle for all time any outstanding grievances or claims the tribes might have against the U.S. for treaty breaches, unauthorized taking of land, dishonorable or unfair dealings, or inadequate compensation. Claims had to be filed within a five-year period, and most of the 370 complaints that were submitted were filed at the approach of the 5-year deadline in August, 1951 In 1946, the government had appropriated funds for the tribal sale of coal and asphalt resources. Though they won their case, they were charged almost 10% of the $8.5 million award in administrative fees. In 1951, the tribe took advantage of the new law and filed a claim for over $750,000 to recover those fees. When Harry J. W. Belvin was appointed chief in 1948 by the Secretary of the Interior, he realized that only federally recognized tribes were allowed to file a claim with the Commission. If he wanted to get that money back, his tribe needed to reorganize. He created a democratically elected tribal council and a constitution to re-establish a government, but his efforts were opposed by the Area Director of the Bureau of Indian Affairs. Ultimately, the tribe was able to file a claim with the Commission on a technicality in 1951. The suit was classified as a renewal of the 1944 case against the US Court of Claims, but that did not stop the antagonism between Belvin and the area BIA officials The BIA had had management issues for decades. Poorly trained personnel, inefficiency, corruption, and lack of consistent policy plagued the organization almost from its founding. For Belvin, relief from BIA oversight of policies and funds seemed as if it might pave the way for the Choctaw to maintain their own traditional ways of operating and reform their own governing council. After eleven years as Choctaw chief, Belvin persuaded Representative Carl Albert of Oklahoma to introduce federal legislation to begin terminating the Choctaw tribe. On 23 April 1959, the BIA confirmed that H.R. 2722 had been submitted to Congress at the request of the tribe, and would sell all remaining tribal assets, but would not affect any individual Choctaw earnings. It also provided for retention of half of all mineral rights which could be managed by a tribal corporation. On 25 August 1959, Congress passed a bill to terminate the tribe, which was later called Belvin's law as he was the main advocate behind it. Belvin created overwhelming support for termination among tribespeople through his promotion of the bill, describing the process and expected outcomes. Tribal members later interviewed said that Belvin never used the word termination for what he was describing, and many people were unaware he was proposing termination. In actuality, the provisions of the bill were intended to be a final disposition of all trust obligations and a final "dissolution of the tribal governments." The original act was to have expired in 1962, but was amended twice to allow more time to sell the tribal assets. As time wore on, Belvin realized that the bill severed the tribe members' access to government loans and other services, including the tribal tax exemption. By 1967, he had asked Oklahoma Congressman Ed Edmondson to try to repeal the termination act. Public sentiment was changing as well. The Choctaw people had seen what termination could do to tribes, since they witnessed the process with four other tribes in Oklahoma: the Wyandotte Nation, Peoria Tribe of Indians of Oklahoma, Ottawa Tribe of Oklahoma, and Modoc Tribe of Oklahoma. In 1969, ten years after passage of the Choctaw termination bill and one year before the Choctaws were to be terminated, word spread throughout the tribe that Belvin's law was a termination bill. Outrage over the bill generated a feeling of betrayal, and tribal activists formed resistance groups opposing termination. Groups such as the Choctaw Youth Movement in the late 1960s fought politically against the termination law. They helped create a new sense of tribal pride, especially among younger generations. Their protest delayed termination; Congress repealed the law on 24 August 1970. The 1970s were a crucial and defining decade for the Choctaw. To a large degree, the Choctaw repudiated the more extreme Indian activism. They sought a local grassroots solution to reclaim their cultural identity and sovereignty as a nation. On August 24, 1970, just hours before it would become law, Richard Nixon signed a bill repealing the Termination Act of 1959. [clarification needed] This close call prompted some Oklahoma Choctaw to spearhead a grassroots movement to change the direction of the tribal government. In 1971, the Choctaw held their first popular election of a chief since Oklahoma entered the Union in 1907. A group calling themselves the Oklahoma City Council of Choctaws endorsed thirty-one-year-old David Gardner for chief, in opposition to the current chief, seventy-year-old Harry Belvin. Gardner campaigned on a platform of greater financial accountability, increased educational benefits, the creation of a tribal newspaper, and increased economic opportunities for the Choctaw people. Amid charges of fraud and rule changes concerning age, Gardner was declared ineligible to run as he did not meet the new minimum age requirement of thirty-five. Belvin was re-elected to a four-year term as chief. In 1975, thirty-five-year-old David Gardner defeated Belvin to become the Choctaw Nation's second popularly elected chief. 1975 also marked the year that the United States Congress passed the landmark Indian Self-Determination and Education Assistance Act. This law revolutionized the relationship between Indian Nations and the federal government. Native American tribes such as the Choctaw were granted the power to negotiate and contract directly for services, as well as to determine what services were in the best interest of their people. During Gardner's term as chief, a tribal newspaper, Hello Choctaw, was established. Along with the Creek and Cherokee, the Choctaw successfully sued the federal and state government over riverbed rights to the Arkansas River. Discussions began on the issue of drafting and adopting a new constitution for the Choctaw people. A movement began to officially enroll more Choctaws, increase voter participation, and preserve the Choctaw language. In early 1978, David Gardner died of cancer at the age of thirty-seven. Hollis Roberts was elected chief in a special election, serving from 1978 to 1997. A new publication, the Bishinik, replaced Hello Choctaw in June 1978. Spirited debates over a proposed constitution divided the people. In May 1979, they adopted a new constitution for the Choctaw nation. Faced with termination as a sovereign nation in 1970, the Choctaws emerged a decade later as a tribal government with a constitution, a popularly elected chief, a newspaper, and the prospects of an emerging economy and infrastructure that would serve as the basis for further empowerment and growth. In 2014, the Choctaw Nation was criticized by many of its own members when it announced that Oklahoma Governor Mary Fallin would be participating in the tribe's annual Labor Day Festival and unveiling a statue meant to honor strong Native women. The reaction was fast and sharp, with comments such as that of Summer Wesley: "Mary Fallin has demonstrated to not be an ally to Native tribes, yet has been chosen to not only appear at Choctaw Fest, but to unveil a statue in honor of our women," Wesley said. "As a Choctaw woman, I am appalled that she is being given a platform for her insincere pandering and her participation in the unveiling causes the statue to lose all honor to me. Further, I think this sends the wrong message to Indian Country regarding the Choctaw Nation's priorities and loyalties. Fallin's participation implies that our Nation condones her anti-Native policies." Te Ata Fisher, (1895-1995), she called herself "Te Ata" (Mary Francis Thompson Fisher), 1/4 Choctaw, Chickasaw. Refer: Pinterest/IMDB "Te Ata"
^ a b c "2011 Oklahoma Indian Nations Pocket Pictorial Directory" (PDF). Oklahoma Indian Affairs Commission. September 2011. Archived from the original (PDF) on May 12, 2012. Retrieved December 31, 2011. ^ Of The Interior, United States. Dept (1916). "Annual Report of the Secretary of the Interior for the Fiscal Year". ^ a b "Executive Branch - Choctaw Nation". ChoctawNation.com. Retrieved April 27, 2017. ^ a b Ferguson, Bob; Leigh Marshall (1997). "Chronology". Mississippi Band of Choctaw Indians. Archived from the original on 2007-10-10. Retrieved February 5, 2008. ^ "Choctaw Nation Opens New Headquarters | Choctaw Nation". ^ "Tribal Council Members - Choctaw Nation". choctawnation.com. Archived from the original on 2012-01-03. ^ "Constitution of Choctaw Nation 1983". Choctaw Nation of Oklahoma. Archived from the original on 2013-12-14. ^ "Great Companies Spotlight: Sovereign Nations | Oklahoma Magazine". ^ "Choctawnationhealth.com". Archived from the original on September 6, 2015. Retrieved April 27, 2017. ^ a b Sharyn Kane & Richard Keeton. "As Long as Grass Grows". Fort Benning - The Land and the People. SEAC. Retrieved August 7, 2010. ^ Remini, Robert. "Brothers, Listen ... You Must Submit". Andrew Jackson. History Book Club. p. 272. ISBN 0-9650631-0-7. ^ Green, Len (October 1978). "Choctaw Treaties". Bishinik. Archived from the original on 2007-12-15. Retrieved March 21, 2008. ^ a b c Remini, Robert. "Brothers, Listen ... You Must Submit". Andrew Jackson. History Book Club. ISBN 0-9650631-0-7. ^ a b Kappler, Charles (1904). "INDIAN AFFAIRS: LAWS AND TREATIES Vol. II, Treaties". Government Printing Office. Retrieved 2008-04-16. ^ Baird, David (1973). "The Choctaws Meet the Americans, 1783 to 1843". The Choctaw People. United States: Indian Tribal Series. p. 36. LCCN 73-80708. ^ Council of Indian Nations (2005). "History & Culture, Citizenship Act - 1924". Council of Indian Nations. Retrieved 2008-05-02. ^ Ward, Mike (1992). "Irish Repay Choctaw Famine Gift: March Traces Trail of Tears in Trek for Somalian Relief". American-Stateman Capitol. Archived from the original on 2007-10-25. Retrieved 2007-09-20. ^ a b c d e Kidwell, Clara Sue. "The Resurgence of the Choctaws in the Twentieth Century" (PDF). Indigenous Nations Studies Journal. . 3, No. 1 (Spring 2002): 8–10. Retrieved 26 December 2014. ^ a b "World War I’s Native American Code Talkers Greenspan, Joseph. "World War I’s Native American Code Talkers. ", History, 29 May 2014. Retrieved August 19, 2014. ^ "Chickasaws and Choctaws to Send Delegation to Capital". Ardmore, Oklahoma: The Daily Ardmoreite. March 25, 1928. p. 3. Retrieved 8 August 2016 – via Newspaperarchive.com. ^ "Indians Break Precedents to Send Women Representatives". Ardmore, Oklahoma: The Daily Ardmoreite. April 3, 1928. p. 2. Retrieved 8 August 2016 – via Newspaperarchive.com. ^ Philp, Kenneth R. (1999). Termination revisited : American Indians on the trail to self-determination, 1933-1953. Lincoln [u.a. ]: Univ. of Nebraska Press. pp. 21–33. ISBN 978-0-8032-3723-0. Retrieved 29 December 2014. ^ "Indian Lands, Indian Subsidies". Downsizing the Federal Government. February 2012. ^ a b "Department Supports Choctaw Termination Bill Introduced in Congress at the Request of Tribal Representatives" (PDF). Department of the Interior. Retrieved 29 December 2014. ^ "Public Law 86-192". US Code. Archived from the original on 23 January 2012. Retrieved 29 December 2014. ^ a b Lambert, Valerie (2007). "Political Protest, Conflict, and Tribal Nationalism: The Oklahoma Choctaws and the Termination Crisis of 1959–1970". American Indian Quarterly. University of Nebraska Press. 31, No. 2 (Spring 2007): 283–309. doi:10.1353/aiq.2007.0024. JSTOR 4138948. ^ Fowler, Louis. "MARY FAILING: Choctaws speak out against Gov. Fallin appearing at this weekend's Labor Day celebration". Red Dirt Report. D. L. Birchfield, "Choctaws." Accessed May 15, 2015.